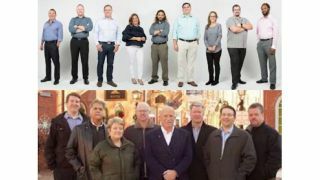 From Top: The Mainline Marketing and Richard Dean Associates teams. Shure has named Mainline Marketing as its new sales representative in Florida, and expanded the territory for existing sales representative Richard Dean Associates to include upstate New York. “We are very proud to be representing Shure in the state of Florida,” said Clinton Muntean, president of Mainline Marketing. “It is our goal to bring significant value to both our customers and the manufacturers we represent. With Shure at our side, we now have the outstanding resources we need to manage and grow our territory and build upon our already excellent reputation."